Beautifully visualized positive and negative karma come together to turn productivity into a game where users participate with highly meaningful motivation. Today Todoist, one of the most popular task managers on the market with over 500,000 users, will integrate worthwhile gaming into its multi-platform task-management software. Deemed Todoist Karma, the new gamification element will promote personal productivity in a way never previously implemented. 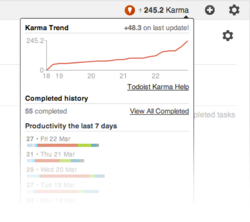 The basic premises of Todoist Karma is to provide striking and advanced visual insight into each user’s productivity. For example, if you add and complete tasks you'll get positive karma; if you postpone or have too many overdue tasks, you'll get negative karma. Built upon a non-trivial algorithm, Todoist Karma is divided into five levels ranging from “beginner” to “enlightened.” The more one progresses, the more difficult it becomes to earn further karma. With a simple mouse-hover, a linear Karma Progress graph appears. The graph shows a visualization of one’s productivity during the last 14 days, along with a count of total completed tasks. One of the most powerful aspects of Todoist Karma is the ability to visualize your karmic progress across seven of the nine different platforms where Todoist is available. Your karma will always be in sync and accessible no matter where you use the app. Traditionally, many other todo-apps focus solely on what needs to be done, but not what the user has actually accomplished. As a result, most neglect to provide insight into each user's personal productivity or how it has progressed over time. With Todoist Karma, envisioning and reviewing your productivity has never been this fast, easy, or attractive. For more information about Todoist Karma please see video demo or visit http://todoist.com/karma. One of the first available task-management softwares on the market, Todoist, launched in 2007, is a powerful task manager for personal productivity that lets users manage tasks from their inbox, browser, desktop, or mobile device. Todoist is available on nine different platforms and is used by over 500,000 people (many from Fortune 100 Companies like IBM, Oracle, and HP) who have completed more than 20 million tasks. Todoist, built by a 13-person virtual team, is proof that amazing technology can be built outside of Silicon Valley by focusing on staying lean, working virtually and finding amazing talent around the world.